Well if you talk about pushing the Envelop... the Envelop has been blasted to pieces. The new King of the liter class has arrived - the BMW S1000RR. 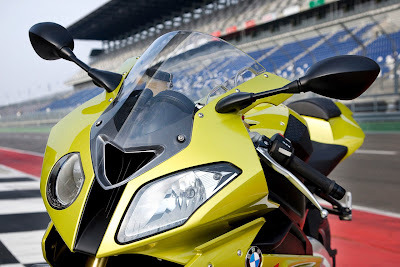 At the press release, BMW said that for the last 5 years they have done nothing but study Japanese Liter class bikes, and they have studies them so much that they know more about these bikes than the Japanese do. I personally have been following up on this bike since it's release late last year because in the list of 2010 Super Sports bikes, this was the only bike which was having the most innovations packed in. So, here we go!! Well if you are studying the very pinnacle Liter Class bikes for the past five years, then you must be knowing the engine damn well. With all the study BMW has done, they came up with one hell of an Engine. An Engine which produces 190bhp (which is of the class of the Suzuki Hayabusas and the Kawasaki Ninja ZX-14) which has been fitted on a chassis which weighs that of 600s. The engine is a pure in-line 4 as against Twins most of the Europeans prefer. A top notch Engine build supported by a very intelligent choice of D-Mode functionality which actually limits the BHP output of the engine at the lowest mode as against the Throttle Response implemented in the R1, but at the higher 3 modes, it resorts back to the Throttle Response ways of the R1. For example the Rain mode limits the output to the lowest of all - 150bhp, select the Sports, Race or the Slick mode, it would give you the full 190 bhp in each mode, but the with each up-shift of the D-Mode, the Throttle Response would become more and more direct. The BMW S1000RR comes with Optional Racing ABS and DTC Traction Control ensures that your ride is not only fun but also safe. The Sachs 36mm inverted forks and the fully adjustable rear suspension all add up to your choice of comfort. For more details on the specs visit the BMW Motorrad website. MCN did a comparo between the current corp of 1000cc bikes with the BMW S1000RR and no points for guessing that they were just struck by the awesomeness of the BMW. This is awesome. Whats the price tag? But why the asymetrical headlamps? Its like a "winking" superbike. Hey Sajal, what about the RC8? Have you been following on it too? I've been following on the complete range of 2010 Superbike releases and frankly speaking, I've not been a huge fan of the RC8 off late coz the bike's actuall performance never matched the radical looks of it. But for the calendar year 2010, KTM has made some radical changes, but sadly the changes are very much track oriented, unlike the other manufacturers who have tried to make their bikes both track and street friendly. The 2010 KTM RC8R is track day pal, but on street it's a bit too much un-comfy.